If we also want to make the Quran our character, we need to follow the Prophet (sa). In today’s day and age it can be a challenge, but we must strive to follow the Prophet’s example because that will certainly lead us to Jannah, which is what we are here in this world to earn. 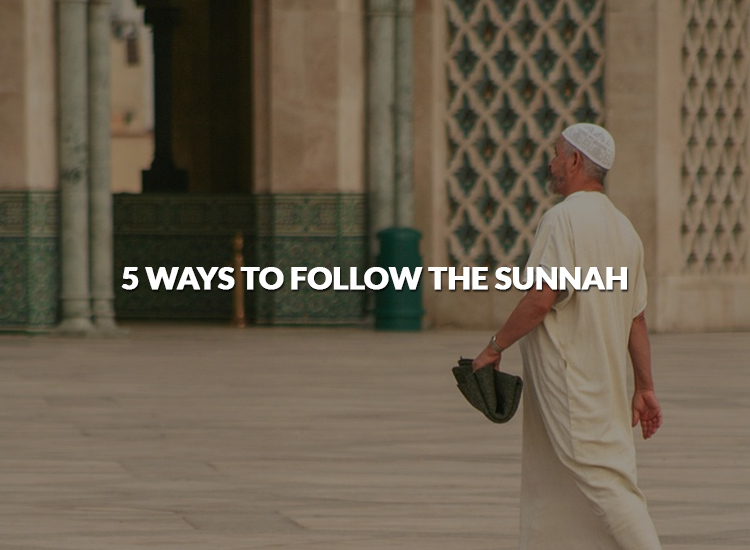 Here are 5 ways to help you follow the Sunnah! 1- Make sure you are following authentic information. One of the biggest dilemmas for our Ummah today is the overload of unauthenticated information. We have started to rely so much on learning online, that we do not stop to check whether the information we are reading is correct or not. As Muslims it is imperative that we make sure that we are not attributing anything that the Prophet has not said, as he said, “Telling lies about me is not like telling lies about anyone else. Whoever tells lies about me deliberately, let him take his place in Hell.” Narrated by al-Bukhari, 1229. Even though one may follow an incorrect hadeeth or tell it to others unintentionally, we need to be responsible Muslims and always check our sources. One of the best online resources for searching authentic ahadeeth is www.sunnah.com. You can cross-reference what you have heard or learnt here to make sure you are not following something incorrect. Alternatively, one can learn from teachers and scholars and www.qutor.com is a good place to look for Quran classes for kids and adults. Do not pick and choose your Sunnah. When you hear something that the Prophet (sa) used to do and you have verified it to be true, then follow it immediately. Let not your nafs (ego) come in the way, and do not let Shaytan or other people deter you. The Sahaba were successful in emulating the Prophet (sa) in every way. Read about them and gain inspiration from them. They were humans just like us and if they can do it, then so can we! Reading about their love for the Prophet(sa) and the lengths they went to in order to emulate him will inspire you as well. When it becomes difficult to follow the Prophet, keeping in mind the challenges that the society today places for the Ummah, then be patient and remember that your reward is only with Allah! Do not seek acceptance or appreciation in this world from others. Be steadfast and know that you will be with the ones you love on the Day of Judgement; if you love the Prophet (sa), you will insha Allah be rewarded with his company in the hereafter. I’m inspired, Rhaifah, a mother of four and able to work so hard in educating us on this very important topic. May Allah bless you more with knowledge. Very nice and very beautiful May Allah bless you and give us the right path to follow Aameen .